Hope everyone had a wonderful Thanksgiving. We had 40+ for the holiday so we were very grateful for many things. Now it’s time to get ready for the Christmas holidays. It seems like I’ve done nothing this fall but put up Halloween and take it down; put up Thanksgiving and now I’m taking that down to put up Christmas. I think the older I get time passes quicker and I move slower. Since I have more than one project going at the same time I have finished some other smaller projects while I was working on the blue bird. I really had to be in the mood to stitch the blue bird and so there were days I did not touch him. I did another big project while I was doing the blue bird…I don’t know why but sometimes I bite off more than I can chew. KC Needlepoint, our newest needlepoint shop opened in June. (https://sudukc.wordpress.com/2015/06/16/no-stitching-todayjust-making-new-friends/) and they have local landmark painted canvases. And of course, one of them spoke to me right away and I had to have it. I could see it finished but was not sure how to stitch it but had an idea. So over the summer I looked at the canvas, made some decisions on what to do first and started on the canvas. 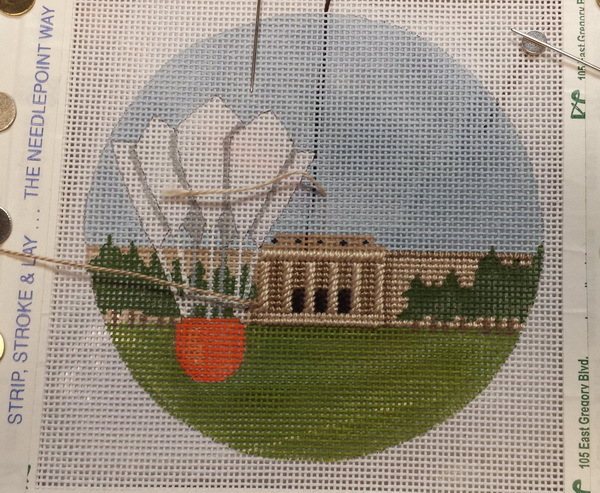 I try to remember to take a picture of the unstitched canvas before I start stitching but I got ahead of myself on this one. I was so excited to stitch it I forgot. But I did get a picture before I had gone too far with my plans. The other thing I try to do is research my projects if possible. By this I mean if it is an actual place like the art gallery or a lighthouse I look them up on Google to see the actual place; this will give you a better sense of the actual colors of the area and the structure. I actually learned something about the shuttlecocks at the art gallery. There are three of them two on one side of the gallery and a third on the other side of the gallery; the gallery building is representing the badminton net (from the artist statement). I’m seldom on one side of the gallery and had not noticed it or did not remember it being there…but I thought it was an interesting bit of trivia…I’ll be good if I’m ever playing Kansas City Jeopardy. First, I painted over the feathers on the birdie and let dry for several days. 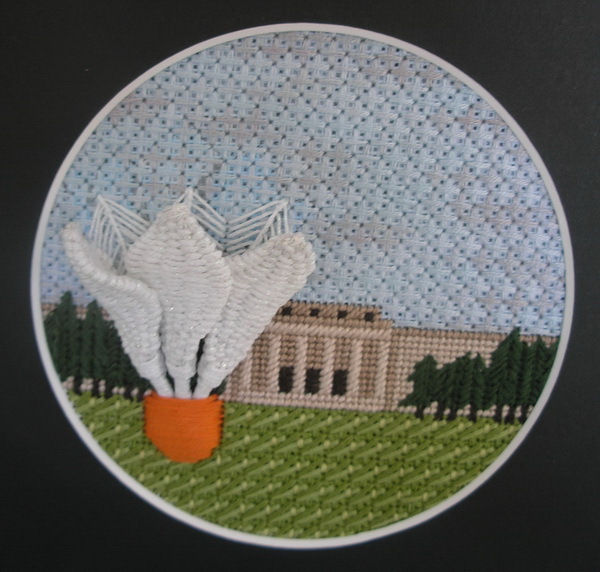 I stitched the background like there was no badminton birdie on the lawn leaving the ball of the birdie unstitched. Using one of the pictures I had I cut the birdie out and loosely basted an outline of the feathers. Then I stitched three feathers with Kreinik braid and then this project almost came to a screeching halt. In my mind I had made three stumpwork feathers and attached them to the canvas. I had gotten some white wired braid and #12 and #16 braid from Kreinik and tried making a feather. My first attempt failed miserably and I decided maybe I should read about making wired stumpwork. Like I said before, sometimes I jump in with both feet and realize I have bitten off more than I can chew. I kept mulling this idea over and over, and the canvas looked good with the three feathers I had already stitched on the canvas but I could see it with these three dimension feathers too. I knew I would not be happy until I figured it out. I took it to a gathering where a group of stitching friends were going to be and showed it to them. They all liked it just as it was but I told them what I saw…then one of them offered a piece of advice she had learned in a class…use a piece of voile or any light weight fabric to stabilize the stumpwork. Voilà, the light was flickering; I would mull this around and figure out what to do. for. 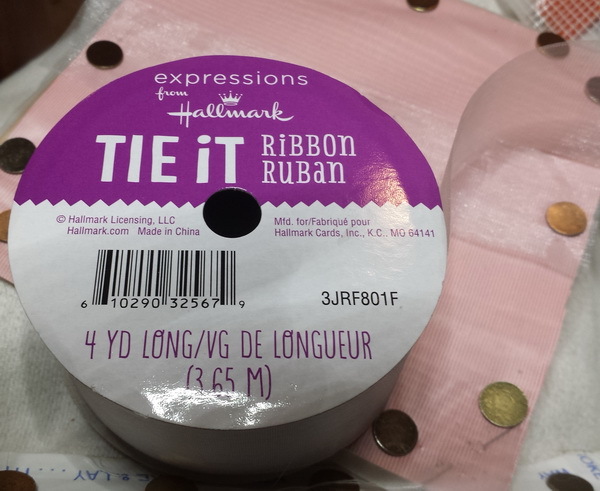 The ribbon was perfect. 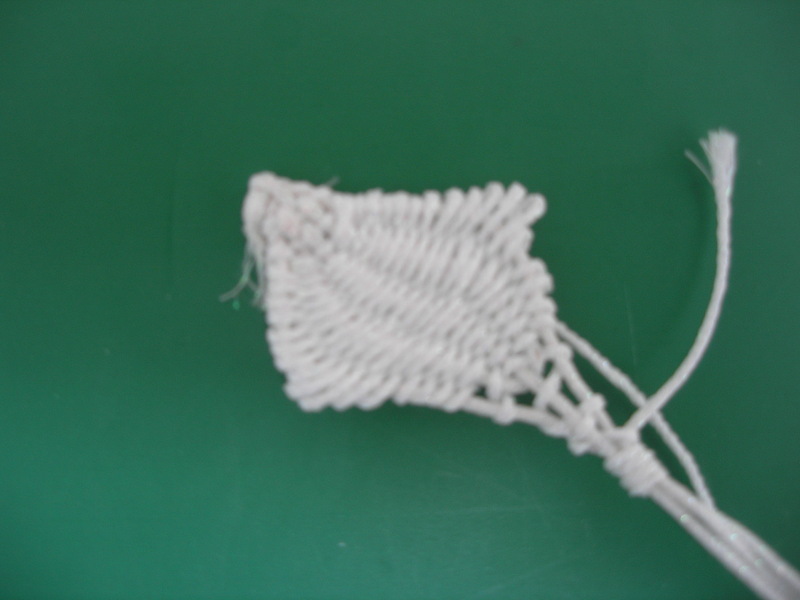 My next hurdle was all the needleweaving books said you needed to uses one piece of wire for the outside. I have no problem with this but I also wanted a piece down the center for stability. After one miserable failure I just kept playing around until I got what I had envisioned in my mind. 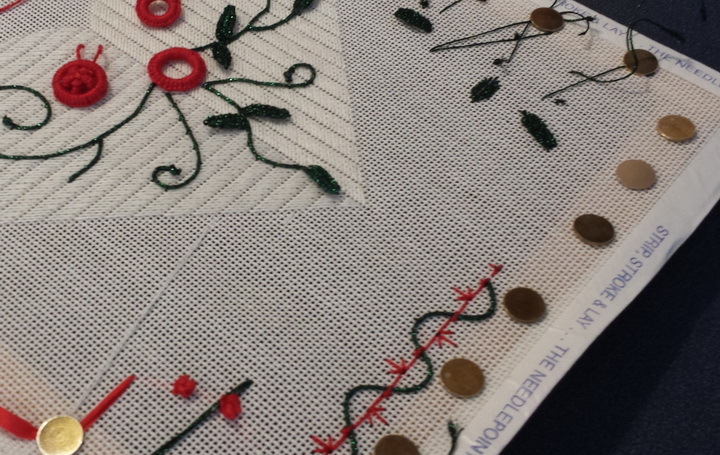 I used Kreinik #16 wired braid and #12 braid for weaving. It worked great after I got the hang of what I wanted it to do. These are the finished pieces. Yes, I did Stitch a second one for the shop without the neddleweaving but with the same overstitching technique…they’re going to have to use a frame. 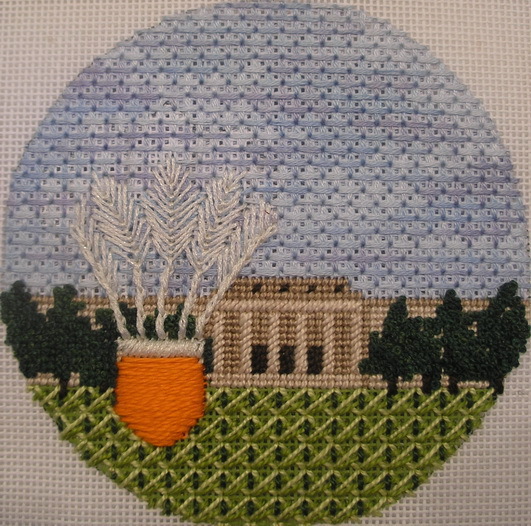 Hope everyone is finding time to stitch this time of year…it is so relaxing . Sorry about last week but the week got away from me and before I knew it this week is almost halfway over too. I have been trying to finish up a heart and move on to St Pat and Easter and poor Mardi Gras just blew by like a cold breeze (hummm it was cold.) But I did make two Temari for the occasion, just didn’t get them posted. Used Kreinik blending filament in purple gold and green togive color to base of ball and stitched with #5 DMC Perle in Green Gold and Purple and a Kreinik braid. Simple 6 division but the Obi bands are different. My creative juices are keeping me awake; I even got up one night to stitch…What can I say…didn’t have a pencil and I was awake so it seemed logical to me. I don’t think dog and DH had the same thoughts… and all I did was play with the Kreinik wire braid for a few minutes, okay maybe 30 but in an eight to ten hour night that’s only a few minutes. 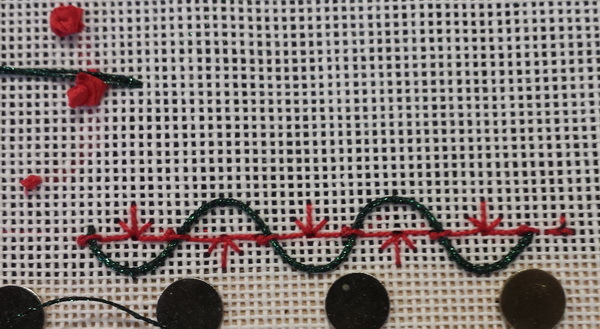 Didn’t even stitch it down during that time…and the light was only on my stitching. And then Jane at Chilly Hollow (http://chillyhollownp.blogspot.com/2015/02/lets-make-ribbon-flower.html) posted this new type of knot that was taught at TNNA winter show (https://www.facebook.com/video.php?v=656298941158846&set=o.108537025890131&type=2&theater ) and I had to try it, seemed perfect for this design. Colonial Knot, French Knot and Ruching. Plus the flowers are another decision I haven’t decided on yet either: Ribbon flowers, beads…decisions decisions!?!?!?!?! And before I stitched the leaves on the heart I wanted to play with stitching picots. Needed to decide whether I wanted to use wired braid or just braid; whether I wanted two, three or four legged picots; would one work better than another and did I want more than one style? You get the idea questions, questions and more questions. But last week I did get this playing accomplished and this week I am really putting effort into finishing up the heart. Should get some great stitching time in as it is supposed to be cold, cold, cold and only have only a couple outings planned.